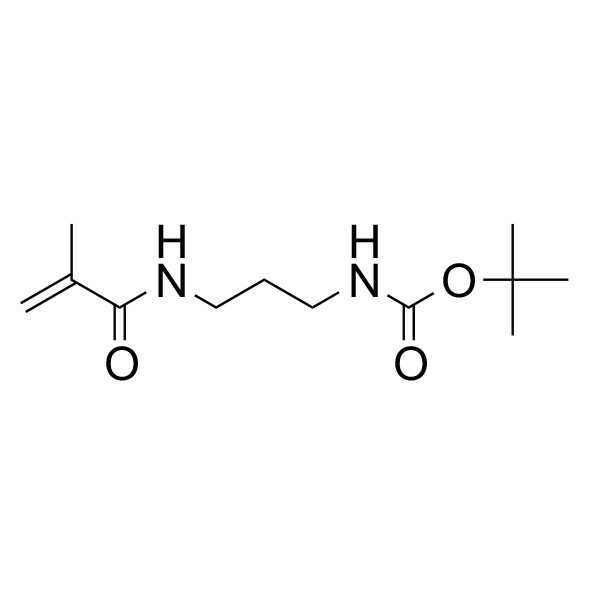 Also known as tert-Butyl (3-methacrylamidopropyl)carbamate, is a blocked primary amine monomer, that readily polymerizes with other vinylic monomers. The t-BOC group, widely used in the peptide chemistry, can be easily deprotected to the free amine with a variety of reagents including HCl/MeOH, Me3Sil, or heat (185°C). Copolymers containing N-(N-BOC-aminopropyl)methacrylamide can be readily converted to primary amino copolymers which can be further modified by coupling to peptides, dyes, etc.